Alan Dickens says Saints decided that George North was ‘not in a position to play for Northampton’ in last Saturday’s defeat to Sale Sharks at Franklin’s Gardens. And the interim head coach is now desperate to move on from the furore surrounding the player. After the 34-25 loss to Sale, technical coaching consultant Alan Gaffney appeared to hint that the Wales wing did not want to play in the match. Asked why North wasn’t involved, Gaffney said: “It’s a pretty good question and it’s a very difficult one to answer at this moment in time. “You’d probably have to ask George. “We picked the side that actually wanted to be out on the pitch and the best side for Northampton. Reports suggest North feels he was unfairly spoken about by Gaffney and the fears are that there will now be a rift between Gaffney and the player, both of whom are leaving Saints at the end of the season. Dickens was asked for a timeline of events leading up to North’s non-selection. And he said: “In terms of the timeline, every single week we have to select a side to play for the Saints and that’s based on being physically ready and psychologically ready. It was claimed there had been a breakdown in communication between North and the coaches, but Dickens insists there were no blurred lines. “He was here last week and we had conversations with him so that (North not playing against Sale) was the decision we came to,” Dickens said. “There was definitely not a breakdown in communication and I have not got a clue where that’s come from. North has featured twice for Wales during the Six Nations so far, coming off the bench in games against England (February 10) and Ireland (February 24). 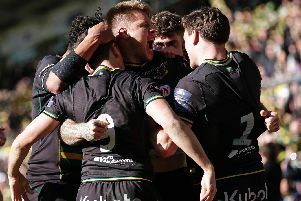 His most recent appearance for Saints, who travel to Bath in the Anglo-Welsh Cup semi-finals on Friday, came on February 17, against London Irish at Franklin’s Gardens.